System on Module Info | EMAC Inc.
EMAC's System on Module line offers quick realization of crucial components, while providing you with reduced costs, scalability, custom integration, and a small footprint. System on a module (SoM) is an ideal alternative to custom engineering. With an SoM approach you get the best of aspects of both buying an Off-The-Shelf Single Board Computer (SBC) and of a Custom Engineered solution. 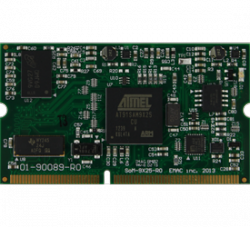 With Off-The-Shelf standard components such as a generic carrier board and SOM module, it is possible to start development on your software applications before the custom carrier board is complete; thus offering a reduced time to market for your system. A System on Module (SoM) is comprised of a small processor module with CPU bus accessibility and standard I/O functionality. The SoM module does not have any connectorization and is designed to be plugged into a Carrier Board. The Carrier board contains the I/O connectors as well any other I/O requirement not provided on the SoM itself. The SOM approach offers reduced risk of an End-of-life product due to a memory, flash, chipset or CPU going end-of-life. With the ability to swap in another CPU SOM board in the system can be running just as it was with no or minimal changes to the carrier board. This also offers scalability by offering a range of processor speeds and features in the same packages. These features offer scalability to allow a company to offer the same carrier board with multiple speed cores for similar products, allowing the economy of scale to bring down per-unit pricing. This approach allows the customer to design a simpler and easier to build Custom Carrier Board, that meets the customer's I/O, dimensional, and connector requirements without having to worry about the processor, memory, and standard I/O functionality. The custom carrier can also reduce or eliminate complicated custom cabling, by providing prewired connectors to connect to other off the shelf cables. Thus reducing or eliminating the need for custom cable manufacturing and reducing final unit assembly time. 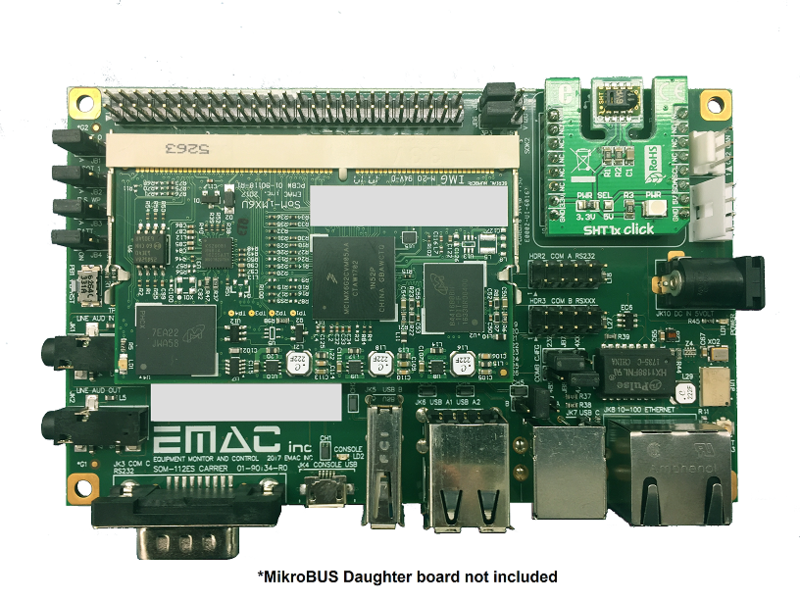 If the customer does not have the ability to design the Custom Carrier board in-house, EMAC's Custom to Order Service (COS) can economically produce a Custom Carrier for you. By utilizing a library of standard I/O modules EMAC can typically deliver Carrier prototypes in 1 to 2 months and also meet your production delivery needs in the future. EMAC also offers Off-The-Shelf Carrier boards for SoM evaluation and early software development. This provides the ability to have a marketable semi-custom product in as little as 6 weeks. By already starting custom software development work on generic off the shelf hardware which includes the same processor core, it has been possible to have your software ready or almost ready when the custom carrier is built. There are two families of SoMs. The microcontroller family offers a very inexpensive and small size solution for Data Accusation and Control, Internet Appliance and Web applications. The x86 family offers PC compatibility with embedded features such as Flash Disk and LCD video. An advantage of the SoM design approach is that within each family of SoMs there are several processor choices. This allows the user to select a low-end processor for initial deployment and upgrade later to a higher end processor as features and need demands. While all SoM modules run the most common operating systems, we specialize in our custom built Embedded Linux and Linux Open Embedded operating systems. We also offer customization of most commonly Embedded Microsoft operating systems: WindowsCE, WindowsXP, WindowsXP Embedded and MSDOS.